Have you been wanting to try some Korean recipes but have been too busy/scared/lazy to go buy all the crazy ingredients? I feel ya. This recipe is for you! This recipe is for chicken marinated in a Korean marinade. All of the ingredients for the marinade are at my grocery store (except for the Asian pear...I just use a regular one). And besides the marinating time, it is pretty quick to throw it all together. Yes! Oh yeah, and this is a sweet marinade...doesn't have the usual Korean kick (has no chili oil or gochujang). You can just eat the skewered chicken, as is, with a few sides. It would be great over some rice and with some grilled veggies. You could also incorporate them into a lettuce wrap, taco or pita pocket. You could top with kimchi, gochujang dressing, or any of the toppings for Korean tacos. Or just make a little extra marinade and reduce that down for a sauce. We just had our with grilled veggies and potatoes (which I blanched). Dinner on a stick! Mix everything in a freezer bag and marinate for at least an hour. 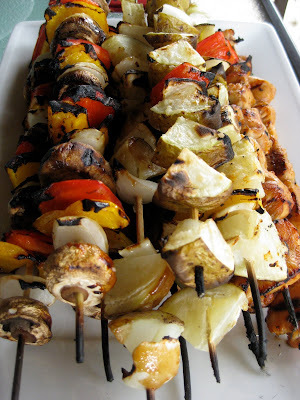 Skewer the chicken on wet skewers and set aside. Strain the solids from the marinade and simmer the marinade until it thickens and becomes saucy, about 5-10 minutes. Grill the chicken until cooked, about 5 minutes per side basting it with the marinade as you go. I don't know if you listen to the Splendid Table on NPR, but I was listening to the latest podcast on my walk this morning and they were talking about Korean barbeque. I loved seeing these pictures as they helped complete the image I had formed in my mind. Thanks for sharing!